P910i Mobile phone, PDA and digital camera � with video. Writing e-mail on a mobile device has never been easier. P910i has a fully featured keyboard on the back of the flip for easy text input. And what about taking pictures and sending them to your friend�s mobile phone or e-mail � this is easy too. Press the camera button, tap the send button on the P910i touchscreen, choose a contact and your picture or video clip is on its way. P910i has the most impressive combination of mobile phone, PDA, camera and entertainment features you will find anywhere. One device. Every possibility. Coolnewmobile - Offering the latest Contract Phones including the Sony Ericsson P910i at the most competative prices around. We offer fantastic mobile internet phones all with FREE text messaging*, If you want an O2 mobile phone why not buy it now from O2. 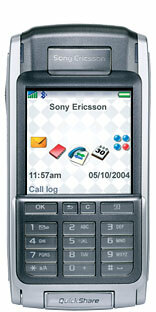 They also have some good deals on the Sony Ericsson P910i.